After lots of crazy manoeuvres by the FIA and major teams in Formula 1 they’ve finally come to an agreement. That’s good for fans and good for the sport, as the uncertainty was really starting distract from the racing. 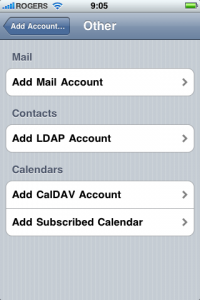 iPhone 3.0 brings CalDAV to the iPhone/iPod touch family. This could be useful for iPhone OS 3.0 who have Google Calendar account. That is if you are using a corporate Exchange account, .Mac/Mobile Me or are not comfortable sharing your contacts with Google (just your times and locations). These options preclude using Google’s excellent Google Sync service, but for all others Google Sync service is my recommendation. For those who would like to use CalDAV, read on. 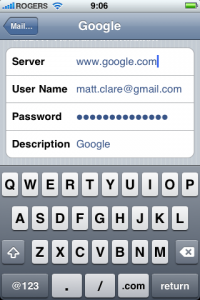 Then enter the server as www.google.com, and your respective User Name and Password, the iPhone should add the description for you. When you’re done press Save and you should see your Google Calendar entries in the Calendar tool and be able to add new entries and receive automatic updates. Before you start, in your web browser (on your Desktop computer or in Safar, just go to the “real” version of Google Calendar) log into your Google Calendar and choose from the fly-out menu beside the title of your calendar on the left and select Calendar Settings. Next locate your Calendar Address. The iPhone should add the description for you, but you might want to modify it to describe the calendar you’re trying to add. After a 205,000 Km of mostly high kilometres, a snowbank or two and other things my 2001 Acura 1.7 EL lost it’s Acura badge. Today it received an upgrade/downgrade by way of a patchy paint job on the front fascia and a Pacific Mall procured blue Honda H. I had red (racing) Honda badges to choose from, and yellow Acura badges, but both were illuminated and that didn’t seem like a good idea. So now my Civic dipped in gold even has a Honda H – it’s still the Fantacura to me! You are currently browsing the iMatt :: The Blog of Matt Clare weblog archives for June, 2009 .